"Our spirits are all free!" 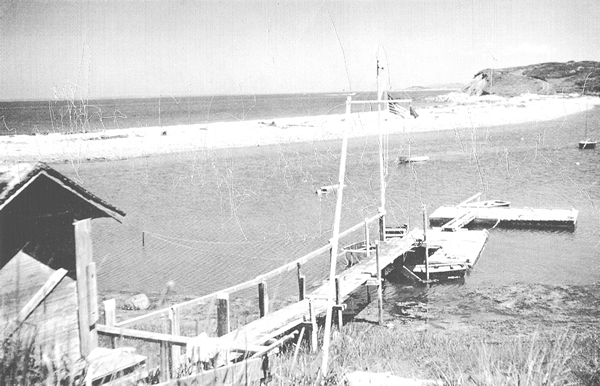 The Cuttyhunk Yacht Club had its beginnings in the 1930s when friends of Connie Wood rented summer homes from him for most of the season. The “summer kids” spent their days waiting for turns on the one tennis court, swimming, diving, playing ping-pong in the Annex, and, of course, sailing. The parents taught the eldest children, who in turn taught their younger siblings to sail. The youngest of all were allowed to be ”ballast” and picked up sailing along the way. Once races began, the youngest were also recruited as safety inspectors, making sure each boat was properly outfitted with bailers and life jackets. The first boats were three Penn Yan dinghies: Rapier (owned by Connie Wood, Jr.) Sea Devil (owned by the House and Walker families) Puff-Puff (owned by the Garfield and Lefferts families). The older boys initiated races and learned to set courses and to follow racing rules. Right form the start, the yacht club was the kids’ project, run by and for themselves. Each season ended with a banquet on the porch of Winter House with speeches and awards. Later the club expanded to include two Canadian Gannett Class boats, built by the caretaker at Pasque. Newie Garfield and Ben Walker each had a Lancaster dory (Newie’s was Viking and Ben’s Samahdi). Oriel and Connie Wood, Jr. shared Debutante, which featured a jib, a genoa, and a keel. These boats were moored at the boathouse located next to the Town Dock CHS has a model of the early yacht club built by Chunk Goodrich. Unfortunately, the hurricane of 1938 carried away the boathouse and most of the boats. This catastrophe, combined with the lack of summer jobs on the island, put and end to the club. In the 1950s, interest in sailing instruction revived as children of the 1930s brought their own children to the island for vacations. 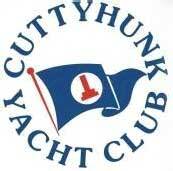 On April 14, 1956, at the home of Robert and Eleanor Moore, the new Cuttyhunk Yacht Club was launched. In the first newsletter, auditor Sally Garfield announced the officers: Alex Brown, Jr., Commodore, Newie Garfield, Treasurer, and George Kidder, Clerk. The group decided that incorporation was advisable and the eight incorporators (C.A. Wood, R. Moore, N. Garfield, Sr., D. Frothingham, R.E. House, Jr., G.H. Kidder, A.C. Brown, Jr., and N Garfield, Jr.) agreed to serve as the Board of Governors pending the first annual meeting of the membership. Preparing for the first season involved many decisions. Commodore Brown, Robert Moore, John Garfield, Wye Garfield, Dave Twichell, and George Kidder bought Turnabouts, some of which were built from kits. It was decided to locate the club near the site of Louis Abrams’ old dock. Mr. Wood assured use of land leading from the road, and an anonymous donor provided a float stage. Treasurer Newie Garfield collected dues ($10 per family), instructors were hired, and, after a work weekend on the Fourth of July, the season began. The first head instructor was Charlie Currier who was housed and fed by various families on the island. The summer went well for the fledgling yacht club. In celebration, a party was held on the lawn of Winter House, complete with decorated cakes, song (a revised version of the Cuttyhunk Show song originally written by Leila Hall), and trophies. The next few years saw many changes. Kitsy and Wye Garfield gave the property for the present clubhouse, built by A.P. Tilton and Allan Potter. Many launhes, floats, and sailboats were added, but the initial traditions continued on. Today the club has programs for youngsters from six to eighteen who enjoy learning to tie knots, row, sail, race, and capsize safely. True to form, many of the participants from the 50s and 60s have gone on to be instructors and Yacht Club officers themselves.